I hope you have a nice cup of coffee or wine because this post is going to be as detailed as possible. I wanted to share everything I could to make it useful to you if you’re going through the process. 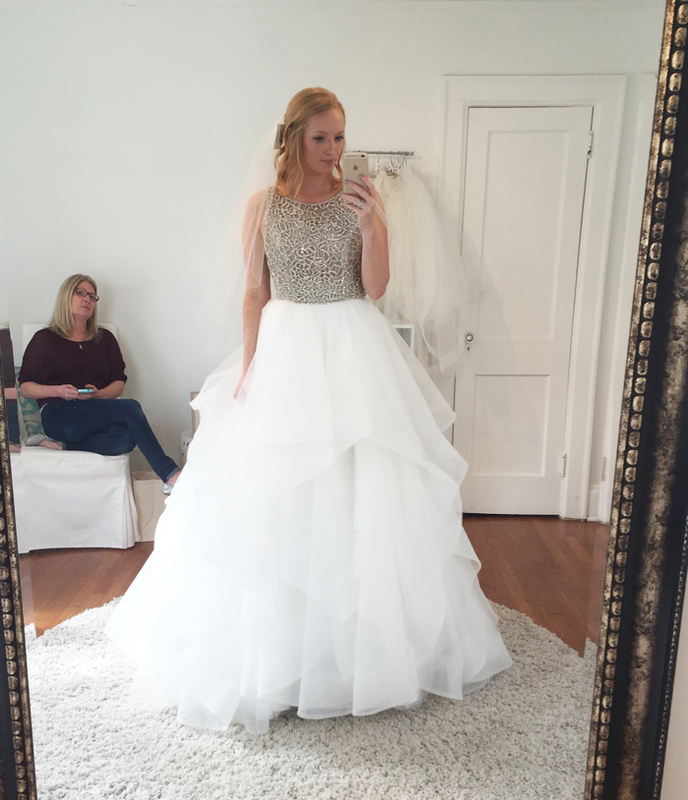 I want the option of two looks – I was thinking an overskirt for the ceremony and a more fitted dress for the reception. All the shops around Atlanta we’re pretty limited in their overskirt selection. They were either just a thin piece of single tulle or were split in the front like this. My ideal overskirt was similar to this one to give you an idea. Remember how I said I didn’t want anything strapless? Well when I started to try on dresses with sleeves or a covered neckline, everything felt scratchy and cause my skin to turn red… not ideal. 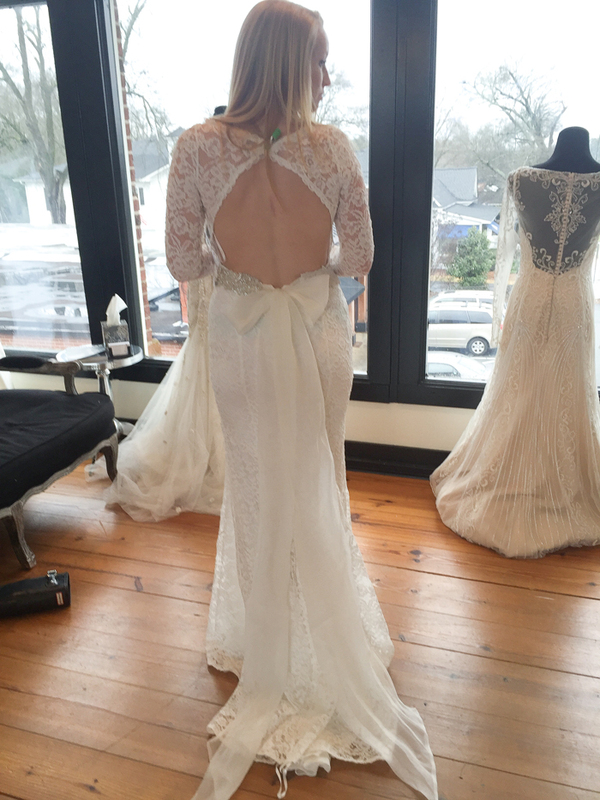 After my first research, I had my heart set on finding a dress from Hayley Paige. Her designs are so fun and youthful, but also a unique. 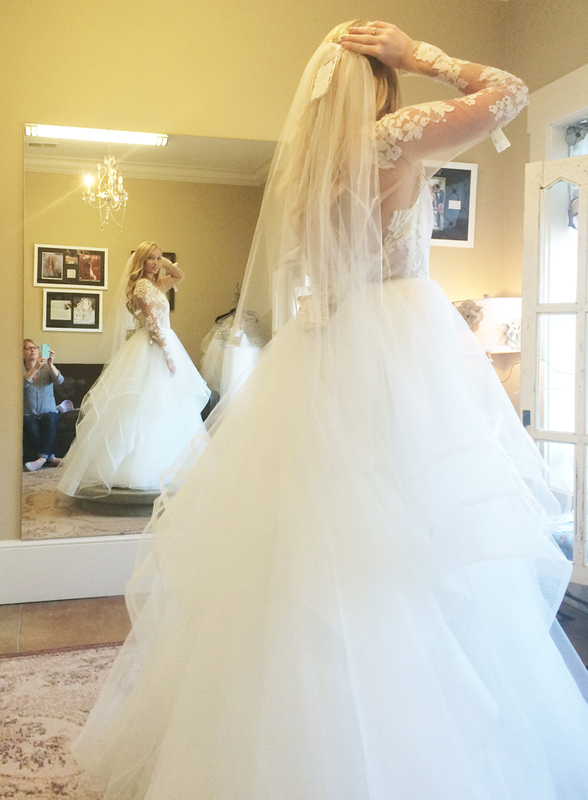 After trying on basically all of her gowns at a trunk show, I still felt like something was missing. This dress was my first favorite, it was flowy, fun, comfortable, and had sleeves. However, something about it told me it wasn’t the one for me. It felt a little too bohemian for my classic southern style. I loved the Dori Gown, but knew above all my dress had to be comfortable, and this one is basically the opposite of that on me. Under the gown, there were two layers of taffeta to make it a ball gown shape, and I learned very early on in life that I hated this material after picking a Belle Beauty and the Beast gown for Halloween when I was 6 years old. I also worried that Tim would have a heart attack if I picked it because we’re both very traditional. 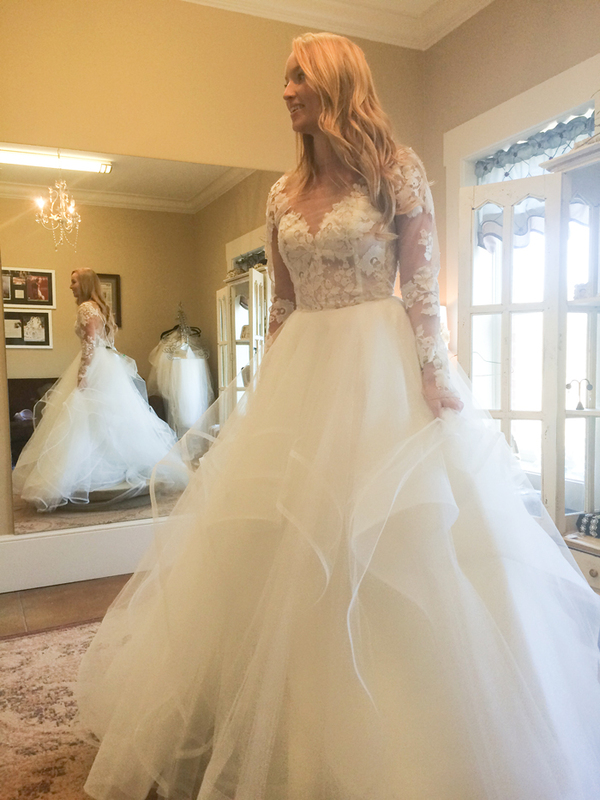 I knew this Monique Lhuillier gown was the wedding dress for me because it was the most comfortable dress I put on. 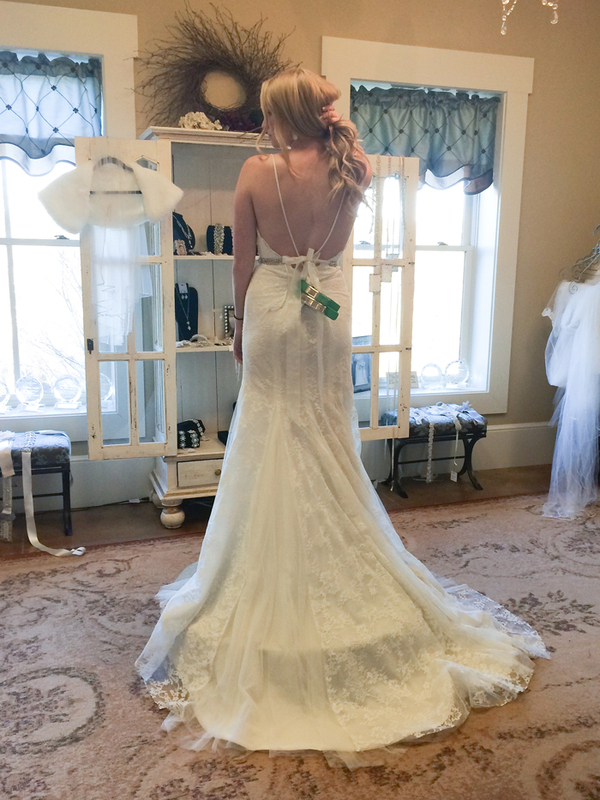 However… it was strapless, something I initially swore off. I figured I could always come up with something in alterations to give it some more coverage in the top. The silhouette was fitted enough where I still considered adding a customized overskirt as well. Flash forward to alteration time, and everything we tried to customize the top didn’t seem right. Also around this time, I was pretty tired of money flying out the window towards the wedding that I decided I didn’t need an overskirt. I went with a more dramatic veil to give me that feel – and saved a good chunk of change by doing so. Two weeks before my wedding, I decided I still wanted to wear something different towards the end of the reception, so I looked around online and came across this dress and instantly fell in love with the subtle pinky-ivory and it’s gorgeous bow detail. 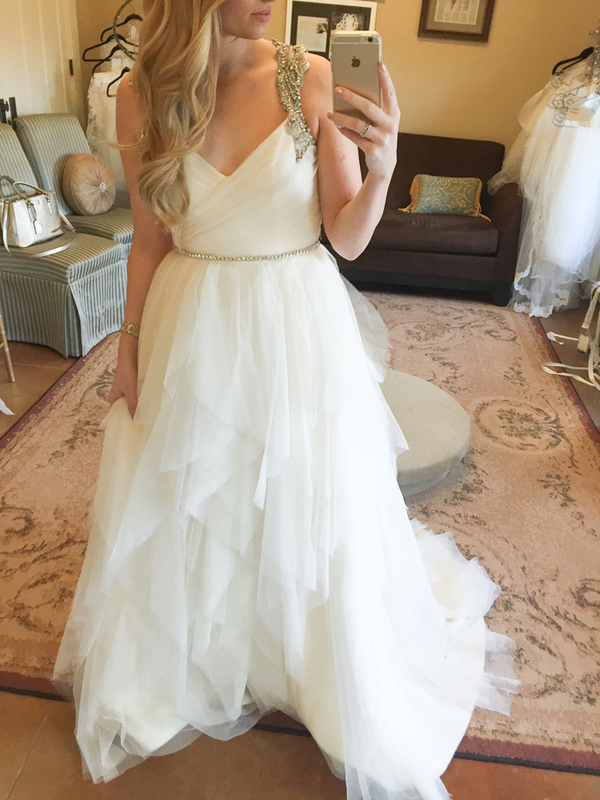 I called my local BHLDN store and somehow, they had ONE dress left on sale in my size . I ended up having a tailor hem it 4 inches the week before the wedding. It all came together in the end. Start shopping 8-10 months before if you want to order a gown. 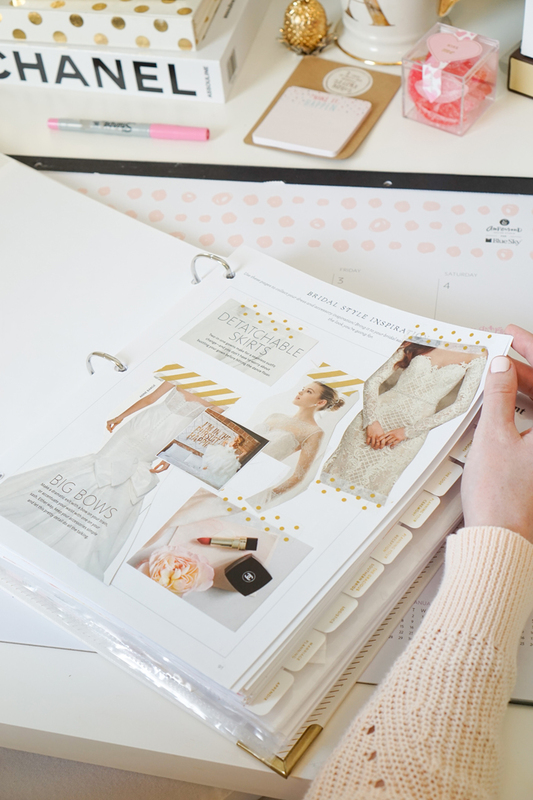 If you’re sample shopping, you don’t need as much time, but it’s better to have more time than stress with a deadline and paying for rush fees. I would recommend looking online (I used these two websites 1/2) to see if there are any specific dresses you really want to try. Look up the shops that carry those lines and call ahead to see if they have the dresses you want to try. That way, you know there are some dresses at the appointment that will interest you and you can check them off the list if they’re not your dress. It also doesn’t hurt to ask what their deposit is so you know upfront how much you may be putting down. However, have an open mind when trying on dresses, especially in the beginning. Remember my little “must have list” at the top? Sometimes you don’t know what you want until you try them all on! 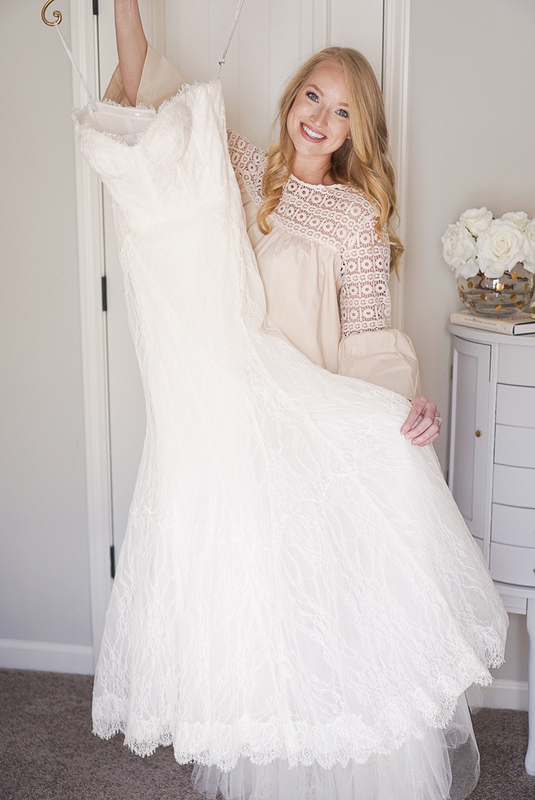 Don’t be shocked at how different wedding sizes are from your typical size. I’m usually a size 4 and purchased a size 8 and it fit like a glove. 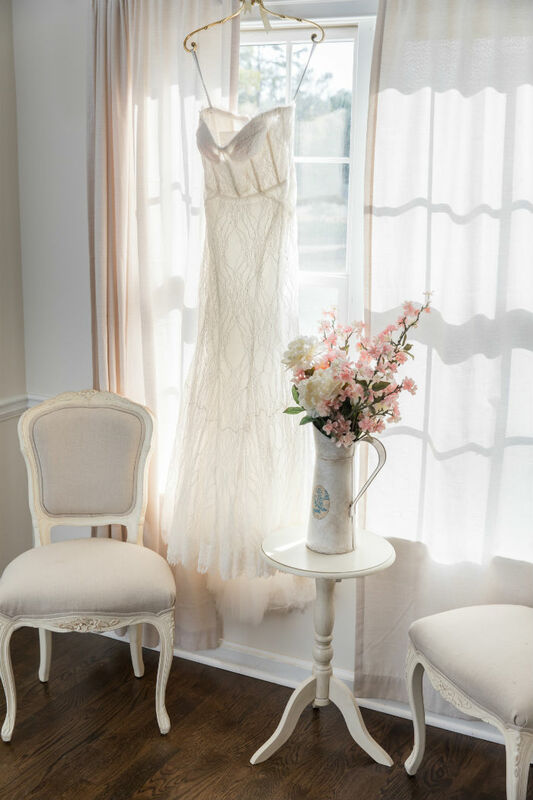 Consider alterations and accessories in your budget. – some salons have in-house alterations. 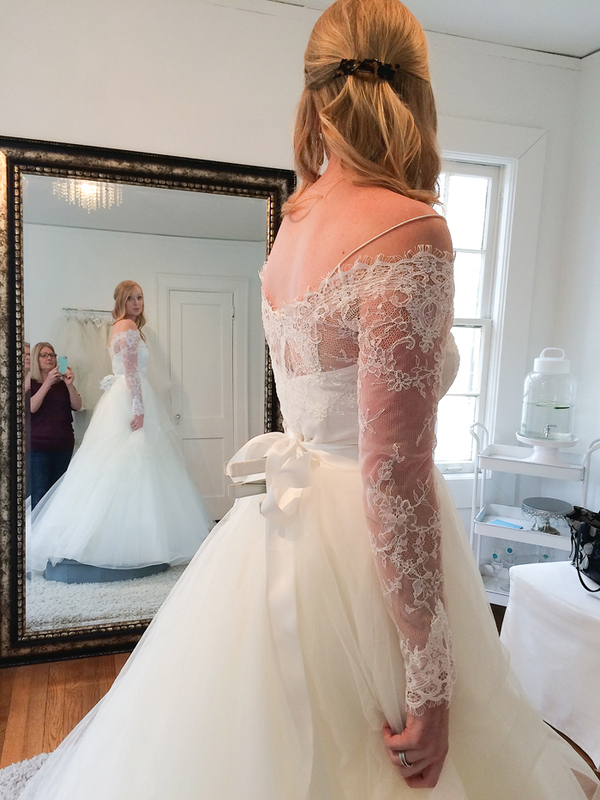 If you can, have them talk through potential alterations and pricing. I’ve heard some salons order the dress bigger than you measure for alterations, although that wasn’t the case at my salon. I recommend waiting to select your bridal accessories. The jewelry, belts, and veils in the boutiques will probably be a lot more than what you can find online, and it doesn’t hurt to space out the payments either. 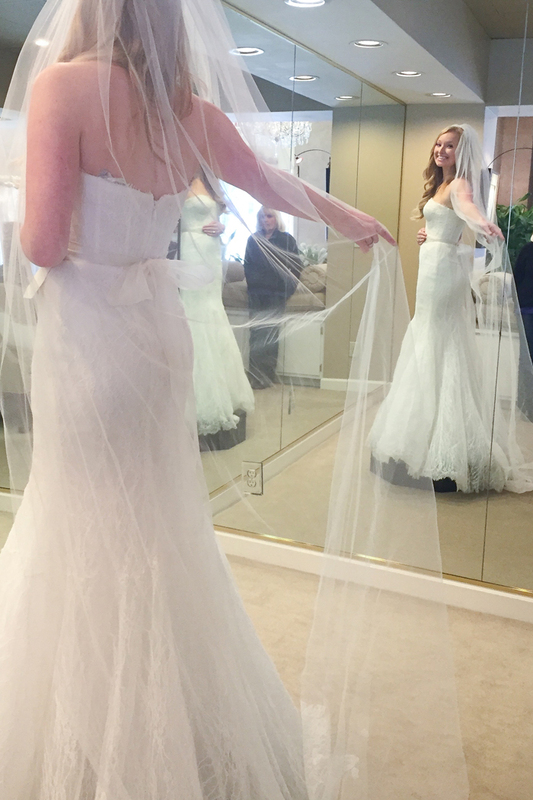 Instead of purchasing the matching veil to my dress for $1000 at my bridal boutique, and I ended up getting a veil for $100 off Etsy. Read or watch all about my bridal accessories here. 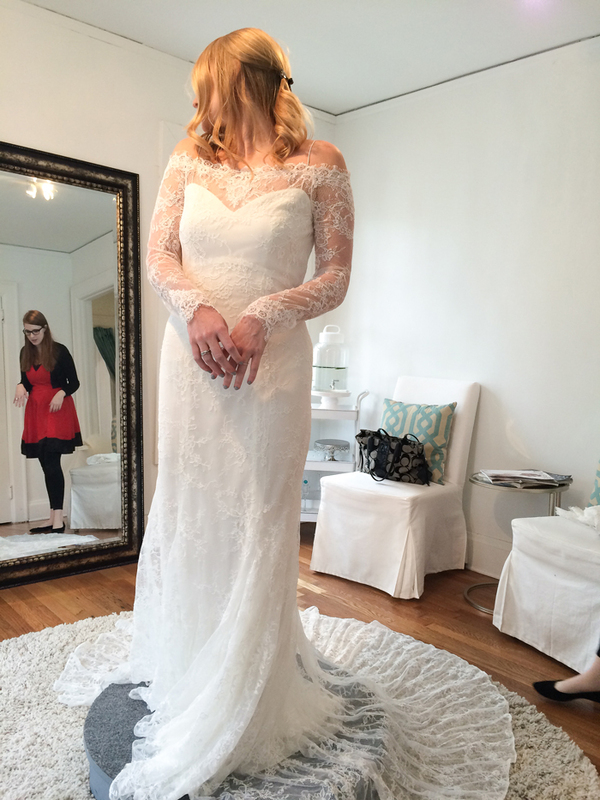 Consider having your gown shipped out-of-state to save on taxes. I shipped mine to my Aunt in FL and she overnighted it right back after she signed for it. The total cost was $70 for shipping vs $400 in taxes. 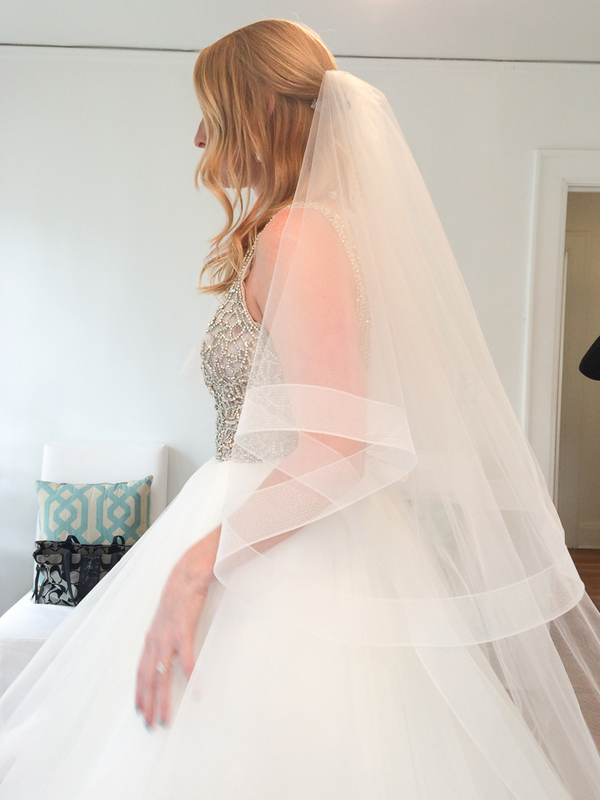 Take a little extra time to get ready for your appointment and bring a hair tie if you’re planning to wear your hair up on your wedding day to see the full look. Don’t be that girl who gets self-tanner all over the sample dresses. Don’t think you need every single girlfriend and family member there, you want to save some surprises for them! I actually only had my Mom and Mother-in-law with me when I said yes. 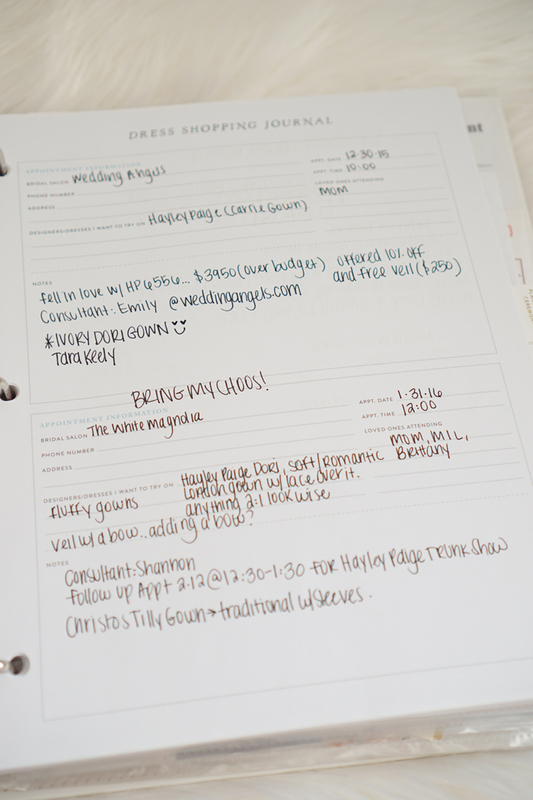 After each appointment, write down your consultant’s name and any specifics you may not remember as far as style numbers, prices, and special offers. I wrote all of this down in my wedding planner. There’s no rule as to how many dresses you should try on. If you know you’re the type of girl who will question if something else was out there (), then keep looking! 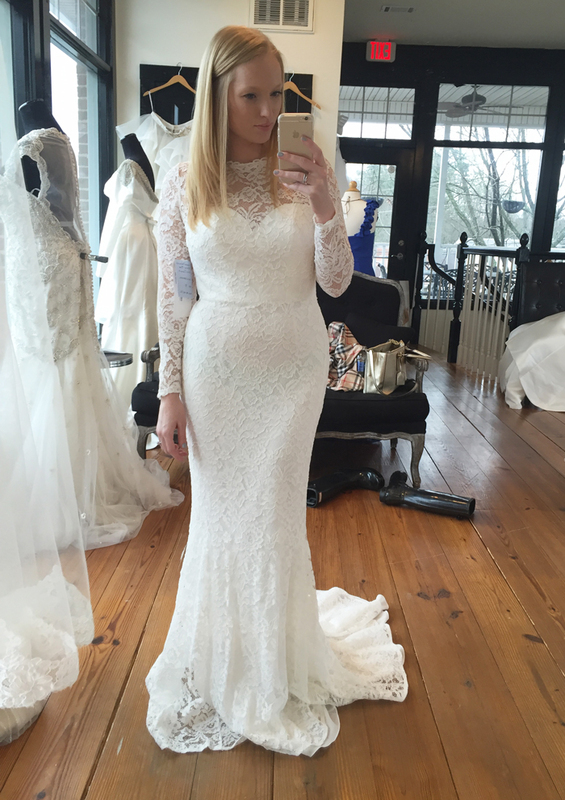 What was your wedding dress style? Drop a picture or link below, I would love to see! 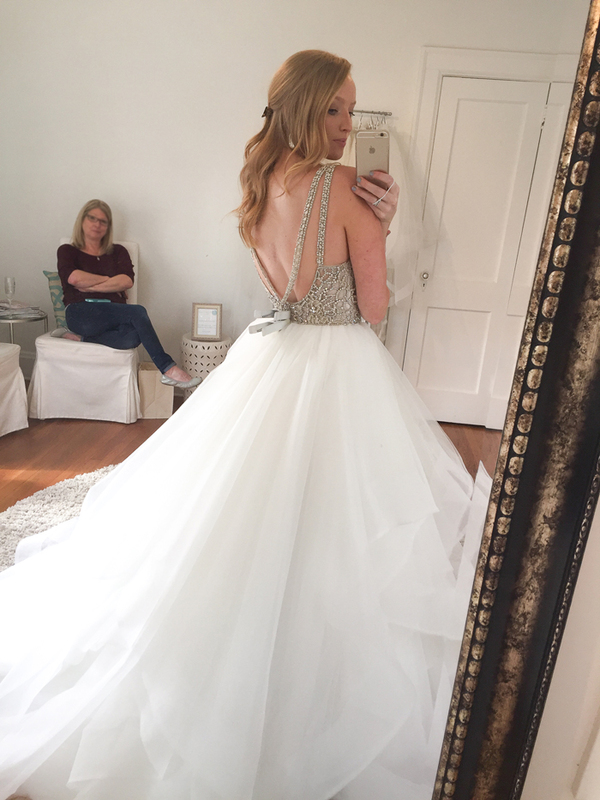 Love this article I just purchased my wedding dress and it's not at all what I thought I wanted but its so pretty!I had the list, photos and everything planned out then put on the dress and thought first thing man this is so comfy. Thanks for this piece love your blog. I also picked the dress I was most comfortable in! Thanks for sharing your story 🙂 I'm sure you were a beautiful bride! Love the dress you picked for your wedding it's gorgeous. I've also always thought that when I get married I don't want a strapless dress, but your advice on keeping an open mind is something I'll have to remember! Fabulous post. Loved your wedding dress. I am also going to buy beautiful dress like this for my wedding at Los Angeles wedding venues and going to hire wedding suppliers from online too. Hope to get my dress in budget as have seen many dresses but most of them are out of budget. Beautiful post. Loved your wedding dress. 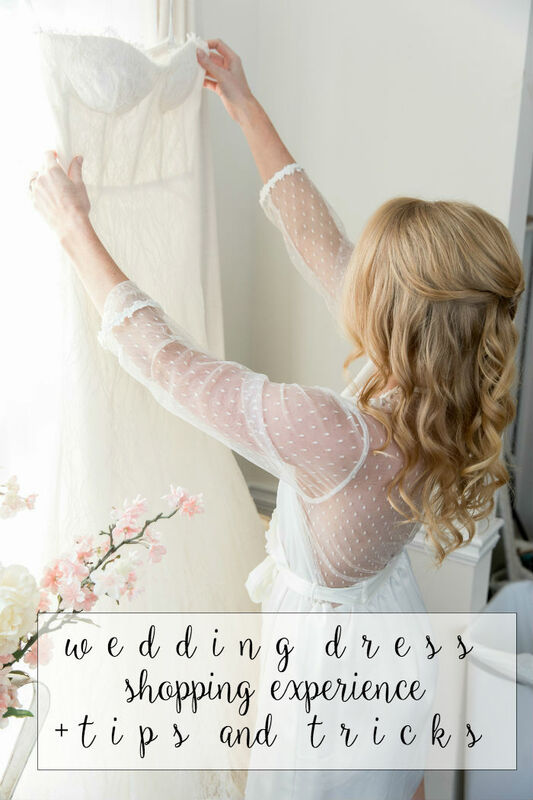 I also buy a beautiful wedding dress for a wedding in Bridal Shops Houston, and going to hire the wedding supplier online. As I see many dresses, I hope to put my dress on the budget, but most of them are off-budget.